Xawo Abdi Hassan rehearses her song. Xawo did not win the competition but the show launched her career as a singer. Once upon a time there was music in Somalia, but then the music started fading out. First one music radio station, then another, then another, until there was almost no music to hear and people started MacGyvering workarounds. One of the people who came up with a workaround was Xawa Abdi Hassan, a young woman who lived in a village outside Mogadishu. "We used to use a memory card, fill the memory card with music and listen to it from our phones," Hassan says. In her house, as she cooked and cleaned, Hassan would sing along with the great Somali singers. But even in this private space she says she was careful. "I used to turn the volume down low, so no one could hear it." The problem was al-Shabab, the Islamic extremist group that dominated large parts of the country. Al-Shabab didn't like music. In 2009 it banned music at weddings, banished musical ringtones and starting punishing people who listened to music on their mobile phones by making them swallow their memory cards. Eventually the musicians themselves were targeted. The famous soloist Aden Hasan Salad was shot and killed in a tea shop, and others were murdered in the street. Through all of that, Xawa Abdi Hassan kept listening and practicing. Because she had a dream: "I just wanted to sing and become an entertainer." For most of her life though — because of al-Shabab — this was a pretty far-fetched dream. 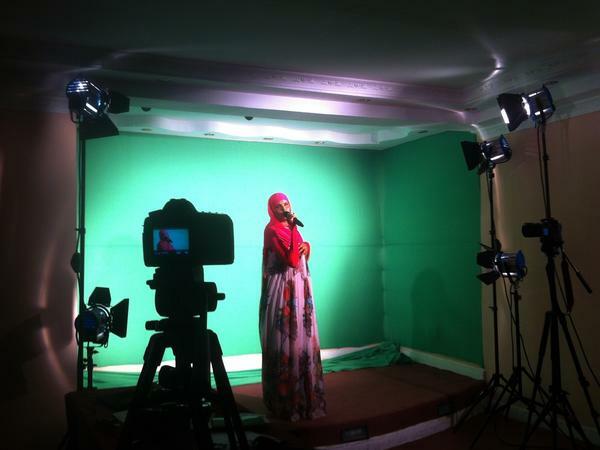 Then in 2013 an unexpected and interesting opportunity emerged: There was going to be a new reality television show in Somalia, an American Idol-style show with singers competing. "As soon as I heard about it I knew I wanted to join," Hassan says. What she didn't know — what she couldn't possibly know — was that this reality show was part of a much larger political plan. The plan was to create a musical reality show that could undermine the power of al-Shabab, or, in the language of the memo distributed to the people involved in the show's creation, "undercut the messaging and brand appeal of armed extremist groups." The United Nations, which was providing the money and support for the show, had concluded that a vivid display of Somali musical culture could serve "as a kind of inoculation against the austerity of Shabab," Ben Parker told me. Parker was the head of communications for the U.N. in Mogadishu. He says that at this point — 2013 — al-Shabab had finally been pushed out of the capital, Mogadishu. But the situation in Somalia was far from stable. There were still regular attacks, so the new government (which had U.N. backing) needed to prove to Somalis that the power of the extremist group really was fading. This is why, Parker says, a musical reality show that challenged the power of the music-hating group was so appealing. "The beauty of a reality show is that the form itself achieves some of your goals," he explains. After all, not only is there music in a musical reality show, there's democratic voting and individual expression. So even in its form it communicates to its audience a very different way of being. This kind of indirect political messaging, Parker told me, is increasingly popular in strategic communications: "Those working in conflict ... are less and less convinced of the value of weapons and more and more convinced that other approaches can deliver the dividends." You get further with songs than with bombs. And so, with U.N. money and support, a small team of people were assembled to create this new al-Shabab-fighting reality show. Mohammed Yahye — or Mo — was one of the people hired for the project. His job was to manage the complicated logistics of putting on a reality show in one of the most dangerous places on earth. Mo says he vividly remembers his response to hearing about the U.N. plan: "This is probably going to get someone killed. I think that was the first thing that came into my mind." Like most Somalis, Mo knew people who had died in the civil war, so he had a deep appreciation of exactly how devastating the wrath of Al-Shabab could be. And while the international producers hired to film the show could be protected — surrounded by armed men from the moment they set foot in the country until the second they left — it was the people who couldn't load themselves onto a plane after the show wrapped that concerned Mo. He was worried about the contestants. "I was constantly worried about after the program is done what is going to be the outcome from these people? That was one of the main things that more or less kept me at night." Still Mo had sympathy for the project; he wanted his country to get to a better place. So he tried, as best he could, to make it work. One of the first tasks, obviously, was to hold open auditions. But in Somalia advertising an open audition for a reality show was kind of like giving the suicide bomber the actual street address of the party you're throwing. "Cause if you do advertise it on the radio then you're putting yourself on target," Mo says. " So we had to think of a creative way to actually to minimize the risk that would come to that." Mo's workaround was to get the word out but create logistics that kept the audition site secret. The ad told people to go to a particular location and climb onto a bus. Mo thought the strangeness of the directions in the ad would dissuade people, but on the day of the audition, it turned out that people were not at all dissuaded. "The queue was really, really scary," he says. " I thought we bit off more than we can chew now, so we need to put a stop to this." But there was no putting a stop to it. Mo remembers making his way back to the gated compound where the buses were dropping contestants and seeing people everywhere. Sitting on the grass, lined down hallways. And he says he was just suddenly overcome with what this reality show represented: "Actually seeing them practicing ... warming up their vocal chords ... gave me a sense of hope that the country is not as damaged as people put it out or how the media normally covers it." One of the people lining the halls that day was the young woman from a small village outside of Mogadishu, Xawa Abdi Hassan. Hassan says it wasn't easy to convince her family that showing up for the audition was a good idea. "Yes, my mom tried to stop me, told me you can get killed for this, but I told her, 'It's ok! Don't stop me! What's meant for me will happen!' And she gave me the permission." And so the morning of the audition Hassan put on her fanciest dress and carefully did her makeup. Obviously she was nervous. Who wouldn't be on the day of a big audition? But there was an additional layer for her. She had never sung in a public place: "That was my first time." She could not sing in public places because it was too dangerous. So Hassan's hands were cold and shaking as she went on. But in her heart, she says, she still felt happy. "I was so grateful that I was even there, to show that I can sing." Hassan was one of the people chosen to go on to the actual competition. Before she left they gave her the date to return. So could this reality show — all the risk and trouble for Hassan and Mo and all the other people involved — actually change reality? Can you call a different world into being by telling the right kind of story? It turns out this question has been systematically studied. How do people come to see the world around them as normal, an unremarkable fact, the way things are and should be? This is the question that interests Betsy Levy Paluck, a psychologist at Princeton University who studies media and how societies change. Paluck told me that for a long time people assumed the path to political or cultural change depended on crafting the right argument. "It was all rhetoric and no poetics," she says. But starting in the 1990s, according to Paluck, poetics started gaining ground because psychologists realized that people consumed stories in this qualitatively different way. "Their defensiveness is disabled. Their counterarguing is at rest." What Paluck wanted to understand was whether this difference in how we consumed stories translated into any changes in what we thought and how we behaved. So around 2004 she hooked up with an organization in Rwanda that was creating a new radio soap opera that was trying encourage tolerance between different ethnicities. And what Paluck found after a year of studying communities in Rwanda randomly assigned to listen to the soap opera was that their exposure had a surprising impact. "What it boiled down to was that despite the fact that people loved this program, it didn't change their beliefs," she says. "But it did change their perceptions of norms, and at the same time it changed their behaviors. Which is why I thought this is something significant." For example, people who listened to the soap opera were way more cooperative when dividing up valuable resources given to them by the researchers, even when they had to divide those resources across ethnic lines. It moved the needle. Which is a sobering idea. "It's a very uncomfortable thought," Paluck says. "We like to think that all of our behaviors flow from our convictions, and what we do is a reflection of who we are and what we think. But we're constantly tuning ourselves to fit in with the social world around us." So what this work suggests is that if you change someone's perception of what constitutes the social norm — as you convince people that the world is safe enough to sing in public even though in actual fact singing in public is incredibly dangerous — then you just might be able to move the needle on the ground. "Don't I cry for my heart and get goosebumps all over?" Those were the words Xawa Abdi Hassan sang when, on the day of the competition, she stood on the stage at the front of room. After Hassan two other contestants had their turns, both men. One had a famous musician father; the second, a man named Mustafa, had composed his own song. Once they finished came the part of the show supposed to serve as a democracy demonstration: the voting. Ballots were distributed to the audience and judges, and for a minute the room was quiet. In this small conference room in the middle of Mogadishu people bent over their ballots and considered the options before them. The son of the famous musician. The girl who practiced at home with the volume turned low. The boy who wrote his own song. In that room they consulted their hearts, weighed strengths and weaknesses, then marked the paper in their laps. It was Mustafa who ended up winning, but Hassan says she was honestly not upset. For her just the act of singing in public for the first time was enough. "I was happy as ... like I was born that day." she told me. In fact, Hassan is now a bit famous. People occasionally recognize her on the street, and even more important, she's part of a professional singing group. As al-Shabab remains a force in Somalia, this means she is still at risk. She says she tries not to worry too much but is often spooked when she sees a car slow down when she's walking. Still, she is committed to keep making music. "Yes, it is dangerous," Hassan says. "But if the young person doesn't stand up for his country and do what's right, how is he helping his country?" Which brings us to this question: Did this reality show actually change reality in any way? It would be impossible to make the case that Somalia is a completely different country now. It isn't. But there is at least one undeniable change since 2013. Music is back in the streets. Brought back, slowly and painfully, through a complicated combination of political strategy and personal courage.